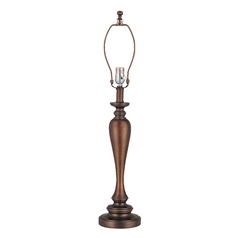 The following are detailed specifications about the Antique Bronze Finish Lamp Base. Every lamp features the Shade Leveler. A Dolan exclusive, the 360-degree Shade Leveler allows subtle adjustments for shade leveling in any direction. It also makes the lamp much more tip-proof than lamps with traditional harps. Additionally, Dolan Designs lamps come with the design flexibility of a longer cord length. Other signature touches include quality metal turn knobs, all-metal sockets and a powder-coated harp. Traditional antique bronze 1-light table lamp. Takes a three-way 150-watt medium base bulb (not included). Suitable for installation in dry locations only. 120 volts line voltage. UL / CUL certified. This lamp is a Mix & Match product, and does not include a shade. Please select a shade that complements the lamp base you have selected. This Antique Bronze Finish Lamp Base is part of the $item.xCollectionName Collection from Dolan Designs. The following items are also part of the $item.xCollectionName Collection.